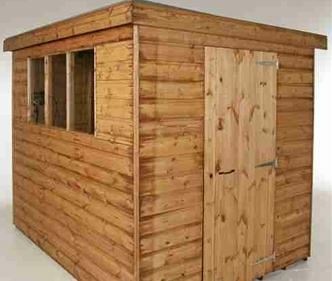 As one of the largest sheds from Treetops Traditional, the 12′ x 8′ Traditional Standard Pent Shed is here to give you a truly incredible amount of space to make use of. This is a structure that is so large and so well made that you could use this as a great workshop where you can have a lot of fun. 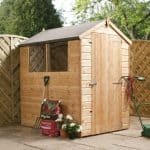 Of if you find that all your tools and gardening equipment is spilling out of tubs and falling off shelves, then this large shed will give you more than enough room to organise and store them all. Spending time in here is going to be something that is always comfortable thanks to the high roof, good flooring and the six large windows that let in light. As soon as you see the 12 x 8 in the title, you know this is one giant of shed, but it is also very well made and is done so using the very best materials. The shed is one very sturdy structure thanks to a solid frame that is sitting behind some very attractive, tongue and groove shiplap cladding. 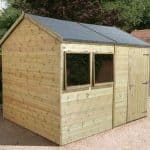 The floor is made to be able to take a lot of weight and as it is constructed with tongue and groove boards it also goes well with the design of the whole shed. On the top there is a long pent roof that is going to keep the water off and also look very good while doing so. The incredibly huge, 12′ x 8′ Traditional Standard Pent Shed offers you just an immense amount or room to make use of. Let us tell you, the picture of the shed does not do this justice. The shed will be in the same style and made with redwood just like the one pictured, but it will be close to twice the side. The width of the shed is a phenomenal 12 feet and the depth is an impressive 8 feet. This kind of room can be used as a spacious workshop or even as an area to just keep a whole lot of things like tools, a mower, gardening items, toys or other things that clutter up your garden and home. The shed is 6 feet 4 inches high at its very highest point and that is right around what we would expect. What we did not expect however was the 5 feet 11 inches of height at the eaves. Due to the shed being long, the pent roof has a very interesting and eye catching look to it. Made with solid, 12 mm thick tongue and groove boarding and then covered with some very high quality felt to protect the boards, this is a roof that is going to keep everything in the shed dry. We really love how nice the tongue and groove shiplap cladding looks on this shed. Treetops Traditional have done a wonderful job in making the walls have such a smooth and classy look to them. They have also made sure that as well as being aesthetically pleasing, these walls are going to last a number of years by having the cladding be 12 mm thick. The frame is one of the most important parts of any shed as it is what is going to keep the shed standing for many years. Treetops Traditional have never disappointed us when it comes to their frames and they have once again delivered here. The frame is made with redwood and at 44 mm x 27 mm is a good thickness. The real crown jewel of the frame those is the rounded edges which Treetops Traditional love to use. Treetops Traditional really do use some of the strongest flooring of any shed manufacturer. They use 12 mm tongue and groove boards which are so strong that they are going to be able to handle a lot of weight. We are not saying you want to start running a gym out of here, but we would bet these boards could easily take the weight of weight discs, heavy tools, a big mower and of course you walking around and spending a lot of time in there. All of the wood is given a base coat treatment which will look after it while it is delivered and during installation. Treetops Traditional do actually say it is fine for around six weeks, but we always suggest, coating the shed with wood treatment near enough as soon as you have built it or within that first week is the best way to go. Also a fresh coating on a yearly basis should be applied to prevent rot. There is a guarantee with this shed, but it is only for a year. Now we know this does not sound like a lot and we also wish it was longer, but really with the materials being as high quality as they are, we do not think you have anything to be wary about here. The door on the 12′ x 8′ Traditional Standard Pent Shed has a great look and at 2 feet 6 inches wide and 5 feet 5 inches high, we feel it is offering you more than enough room to get into the shed with larger items. One thing that is really interesting is that if you want to change things up a little bit, you can have a stable style door. Also if you do not mind spending an extra, £53.99 then you can have the door be upgraded so that it is a 4 foot wide double door. No matter what style of door you go for it is going to be kept in its place thanks to some heavy duty hinges. Along one side of the shed there are six horticultural glass windows. We thought that with there being so many windows that perhaps Treetops Traditional would have cut costs and used, styrene, but no. They have used actual glass just like they do with their smaller sheds. While the windows are fixed, you do have the option to upgrade the windows so that they can be opened. This will cost you, £31.99 per window that you want to upgrade which is a fair price and something to consider if you plan on spending a lot of time working in here. There is a lock on the door which is fantastic as it does save you having to pay for a padlock. The whole shed has a very secure design and with that door locked up on an evening and when you are away, your belongings are going to be safe inside here. Nearly one whole side of the shed has windows so there is pretty much zero privacy on offer with this shed. We are not knocking it for this at all, but your belongings are always going to be easily viewable because of these windows. Some fabric, curtains or even blinds would fix this issue. Or they do give you the option to have the shed be fully boarded so there are no windows at all. 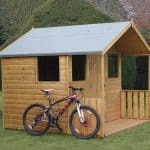 There are a few things that you can do to this shed to give it your own personal touch. 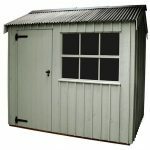 First of all, treating the shed can be done with a coloured wood treatment so that is one way you can alter the look. Also when you order the shed, you can pick one of four different positions for the door to go. If you have the door on one of the sides then the this will change the layout of the windows a little bit and so there is always that to think about. Just above we talked about the window and door extras that are available, but there are a few other things that may interest you also. For those of you who are scared at the thought of doing anything that involves a screwdriver or a hammer, they have an installation service for, £119.99. If you want to give that already strong floor a little bit more back up then for, £61.99, you can get a high quality set of wooden floor bearers. We really thought that with using so much wood on this large shed that a few corners may be cut, but they are not. This is a high quality shed from the bottom all the way to the top of that pent roof. 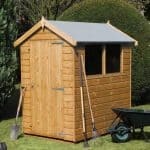 Treetops Traditional have chosen the materials for this shed very wisely. 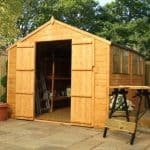 We see this shed being in your garden for 20 or more years and as long as you treat that wood, it will look amazing for those 20 plus years. Look we know this sounds cheesy, but the only problem with this storage space is trying to figure out what to do with it all. Any shed that is 12 feet long is going to require two people to build it and take around 3-5 hours. But as long as you do what the instructions tell you, then you will find this to be quite the fun experience. This is not a shed that is cheap, but we have to tell you that because of the high quality of the materials, the longevity of them and also just the really cool way the shed looks. That we do see this as being good value for money even though it is just under a thousand pounds. 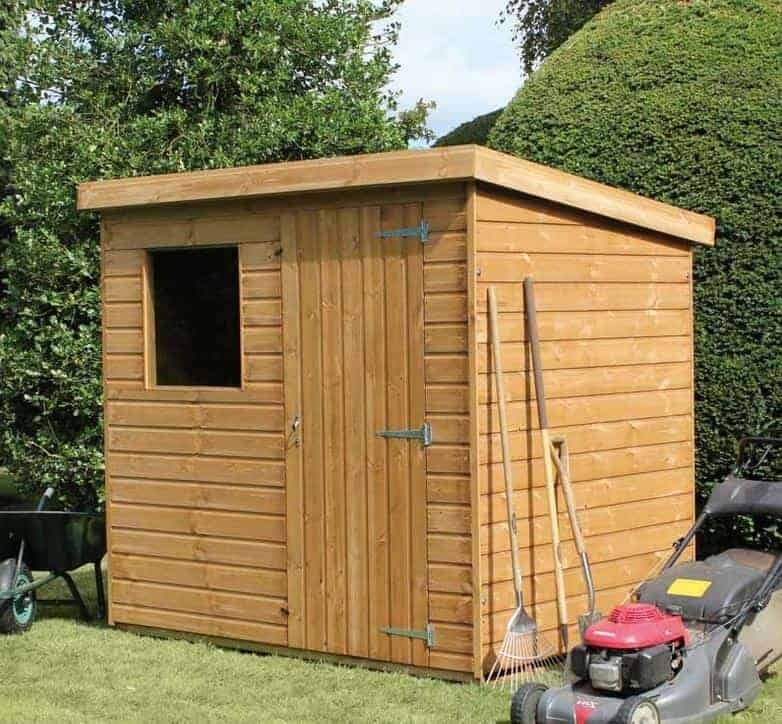 Final Thoughts: This is one very high quality shed and while yes the, 12' x 8' Traditional Standard Pent Shed is not one of the cheapest sheds out there, we feel that for the money, you are getting one of the best, large sized sheds that Treetops Traditional have ever produced. This is going to last you a very long time and due to its huge size, you can use it in a multitude of ways from general storage to a place to do a little DIY on the weekends. There may be cheaper sheds out there, but we can assure you that they are not made with as high quality materials as this one is and there is no way they will give you the 20 plus years of service this one will. If you want to buy just one shed and have that last you a lifetime then this is well worth seriously thinking about.